Microscan barcode Fixed Compact single line scanner optimized for reading small high-density symbols. The QX-830 laser scanner combines revolutionary flexible connectivity with high performance decoding capabilities to reliably read 1D bar codes in almost any automation environment. High performance, simple connectivity, and IP65 enclosure make the QX-830 an ideal laser scanner for any industrial application. The QX-870 laser scanner partners the latest technologies in barcode reading and connectivity into an easy to use solution for barcode track, trace and control applications. Simple to set up and deploy, the QX-870 an ideal laser scanner for any industrial application. Versatile scanner for a wide variety of uses throughout the factory floor. Reads bar codes up to 10 feet (3048 mm) away. 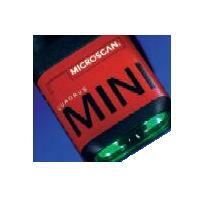 Microscan's newest industrial laser bar code scanner features extended read range and easy programming. The MS-890 reads both linear and stacked codes whether damaged, poorly printed or skewed. Versatility and rugged design make the MS-890 the ideal multi-purpose scanner for the toughest industrial bar code tracking applications.. The MS-3 laser scanner offers the fastest read performance in embedded compact bar code scanners. The wide scan angle of 70 degrees is coupled with ultra-compact size and flexible mounting. Capable of decoding 2,000 scans per second in real time, the MS-9 delivers a decode rate unmatched among small fixed mount scanners. The Microscan mounting arm is a robust device for mounting unattended bar code scanners in virtually any environment, including industrial applications.